Zol and I live in Cebu City Philippines and will soon travel to the USA and live in Sugar Land Texas. Living Abroad for the last 5 years there a few things I learned that will assist in your journey. 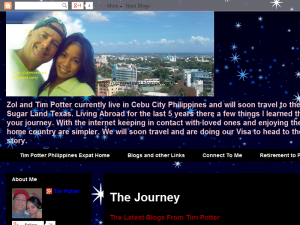 This what your Philippine Expat From Texas Blog Ad will look like to visitors! Of course you will want to use keywords and ad targeting to get the most out of your ad campaign! So purchase an ad space today before there all gone! If you are the owner of Philippine Expat From Texas, or someone who enjoys this blog why not upgrade it to a Featured Listing or Permanent Listing?